SUBHEAD: TEPCO says if all goes well, removing all of the assemblies will take about a year. Image above: Illustration of Reactor 4 fuel removal system. From original article by Kyodo Graphic. Click to enlarge. The decades-long decommissioning process at the crippled Fukushima No. 1 plant is about to take what Tokyo Electric Power Co. says is “an important step,” as the utility starts removing fuel rod assemblies from the spent fuel pool high up in reactor building 4 sometime this month. 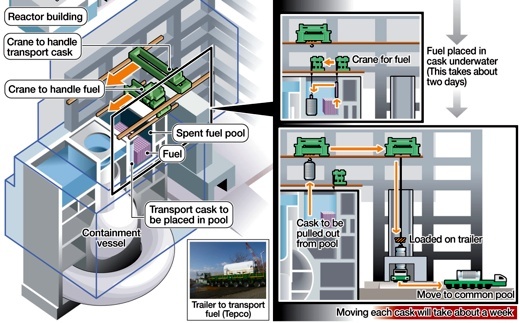 Moving the massive amount of radioactive fuel assemblies out of the shattered building is significant because it will allow Tepco to monitor the fuel much more easily at another pool in an undamaged facility, experts say. Meanwhile, they stress the task must be handled very carefully to avoid dropping and damaging the assemblies. “Usually, spent fuel rods are safely stored in sturdy reactor buildings, but reactor building 4 experienced a hydrogen explosion, so it has lost its full containment capability,” said Kiyoshi Takasaka, an adviser on nuclear issues to Fukushima Prefecture. The hydrogen blast occurred March 15, 2011, four days after the earthquake and tsunami, blowing the roof off the building and showering debris into the pool. The pool has 1,533 fuel rod assemblies, 202 of which are unused. Once removed from the pool, the assemblies will be stored in a common pool in a different building. Each assembly, a zirconium alloy box, is about 4.5 meters long and contains 60 to 80 fuel rods. A fuel handling machine, which is like a hoist, set up over the pool will lift the assemblies one by one and place them into special transport casks. The casks will be put into the pool ahead of time, so that this work is done underwater to prevent gamma radiation from spilling to the outside environment. Each cask can store 22 assemblies. A crane installed above the fuel handling machine will load them onto a trailer for transport to the common pool. If all goes well, removing all of the assemblies will take about a year. Tepco said it is using nearly the same removal equipment used for regular nuclear operations. Lake Barrett, a special adviser to Tepco who was in charge of the cleanup work after the Three Mile Island nuclear accident in the U.S., said he visited the plant Wednesday and was impressed with Tepco’s preparations. Building 4 has been reinforced with steel frames and a cover, the equipment is in place and the workers have been trained well for the operation, Barrett said. “Now I feel confident that they can complete this job properly,” he said, adding that the level of Tepco’s preparations will make the operation almost like a normal fuel removal. Still, it will be different than performing this operation in an undamaged building, and extra caution is a must. For instance, engineers normally program coordinates into the fuel handling hoist and let it run automatically, but they will manually control it for this operation. Takasaka said it is essential that the people in charge of the task have enough training in handling the manual operations. He added that although Tepco has been picking debris out of the pool, there are still small pieces that could fall between the assemblies and racks that contain the assemblies, possibly making it harder to lift them or even breaking them. Barrett, who saw the pool for himself, said the water clarity is good but it is true that the assemblies could get jammed by small debris. Tepco said it is ready for such eventualities. For instance, it plans to use underwater vacuum cleaners as much as possible. Also, if the hoist detects extra weight when removing the assemblies, it will stop moving to avoid forcing the assemblies. Another risk is dropping the assemblies and damaging them. “It is imperative not to drop the assemblies when removing and after removing them from the racks,” said Hisashi Ninokata, a nuclear expert and professor at Polytechnic University of Milan in Italy. “In the worst-case scenario, dropping a cask is conceivable. To avoid that, it is important to come up with multiple layers of measures,” said Masayuki Ono, a Tepco spokesman. For instance, the crane’s control wires have been doubled, and it is designed not to drop the assemblies if the power is cut off, Tepco says. And if an assembly is dropped and gets damaged enough to release radioactive materials, the radiation level outside Fukushima No. 1 will still not exceed the legal limit, the utility claims. This estimation is based on a scenario in which one assembly falls and strikes others, resulting in damage to all of the fuel rods contained in two assemblies. Earlier this week, Tepco found three damaged assemblies that will be difficult to remove, but officials said the damage appeared to have occurred before the March 11 disasters. Ninokata feels that as long as Tepco is sufficiently prepared and proceeds carefully, it is hard to imagine that any assemblies will get damaged, but if this does happen, he agrees with the utility that harmful amounts of radioactive materials won’t escape into the environment. 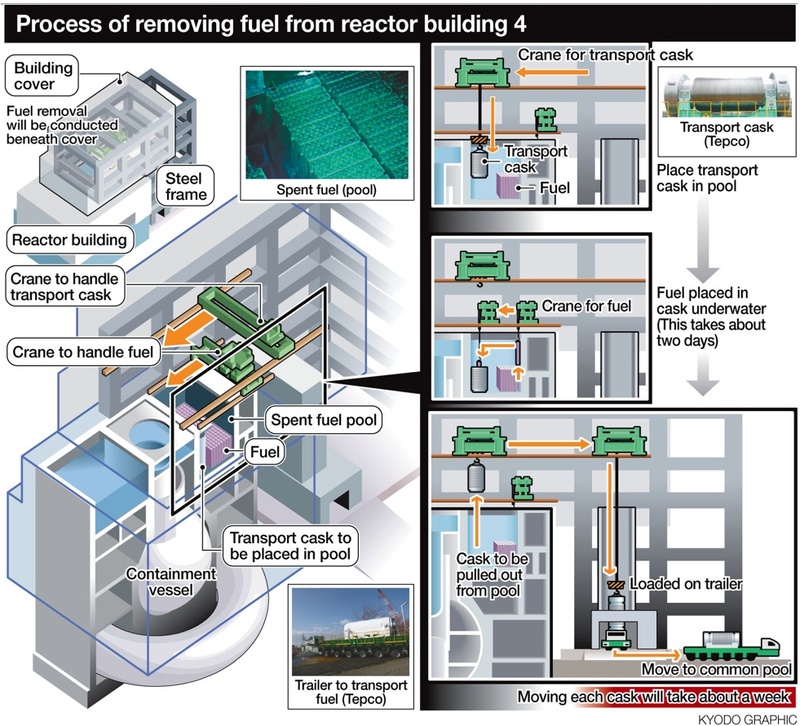 Asked if it’s possible for the spent fuel to achieve recriticality, Zengo Aizawa, vice president of Tepco overseeing the Fukushima crisis, said this is highly improbable since the removal process basically deals with one assembly at a time, and the utility has confirmed that one assembly alone cannot cause a nuclear chain reaction. A lot of misdirection and too much transparency on #4. Is it to deflect attention from #3 with vaporized plutonium and uranium (88 tonnes)? Fukushima - What me worry? is Antifragile better than Resilience? OMG GMO Bill 113 Passed! Even if Earth is Fucked?